Raise your hand if you’re a little (or a lotta) dip obsessed! Ok, that’s everyone, right? 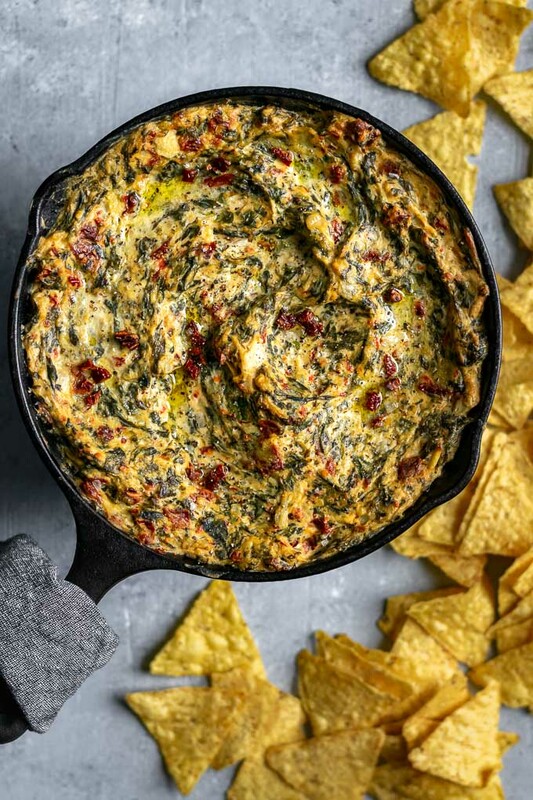 Well, I’m pretty excited about sharing this recipe for the best vegan spinach artichoke dip. Baked until hot and bubbly, this veggie-filled dip needs to be on your menu! 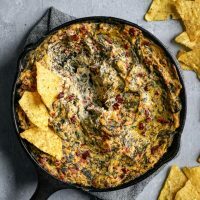 This spinach and artichoke dip tastes like that indulgent dip of your pre-gan past, but I promise you this recipe is infinitely better! First of all, it’s not made with pounds of dairy-based cheese, mayo, sour cream, and/or cream cheese–so your heart health will thank you. *unless you use a nut-based vegan cream cheese! Secondly, it’s protein packed, and not just from the spinach! Instead of using a vegan mayo or sour cream, I’ve blended up silken tofu to a creamy smooth texture. But you’d never guess there was tofu in it! I actually based this recipe off an older one of mine from my old blog, and in that version I used lots of vegan mayo. But I actually prefer this recipe! Same great taste, but now I feel better about eating half of the recipe in one sitting. Because, boy does this spinach and artichoke dip packs a punch of flavor! I’m not calling it the best for nothing! I really think this dip is spectacular. And we’re not going all out health-food here. I did use tofu, but I’ve added some oil and seasonings (lemon juice, dijon mustard) to give it a bit of a mayo consistency and taste. Plus along with the tofu, I use vegan cream cheese to make a rich, thick, creamy dip. 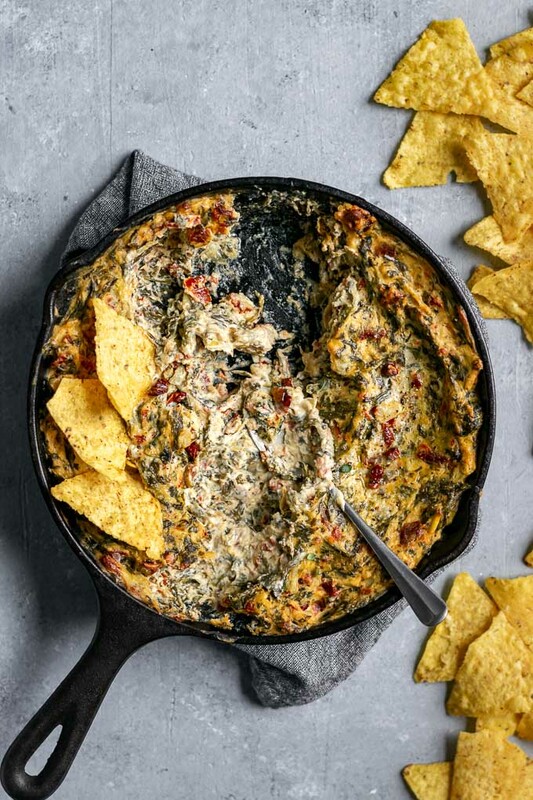 A scoop of nutritional yeast enhances the cheesy flavor of the dip. And a generous addition of herbs takes the artichoke and spinach dip to the next level. Thyme, oregano, and chives.. is your mouth watering yet or what? No? Just me? I like my dips to be nice and peppery, so add a double dose of heat. Crushed red pepper is a given, and nestles a mildly spicy kick into each bite. Then I like to add freshly ground black pepper in seemingly excess amounts so that the dip dances across the tongue. In my original dip there was no need for salt with the salty mayo and cream cheese as the base. In this version you can salt to taste. I ended up adding about 3/4 tsp of salt. Once we’ve mixed together our creamy and flavorful base, add in the chopped spinach, artichoke hearts, and sun dried tomatoes. I use frozen chopped spinach for it’s convenience. You can defrost it slowly in the fridge overnight or in minutes in the microwave. It’s already cooked, but defrosting is an essential step as this allows the excess water to be manually squeezed out from the spinach. You don’t want to skip this step! Nobody wants a watery dip. I love adding sun dried tomatoes to this recipe. They add little bursts of sweet and tangy, tomatoey flavor throughout the dip. You can use either the dry packed or oil packed kind. If using dry packed and they are very dried out you will want to rehydrate them a bit in boiling hot water, just until they are soft. This isn’t necessary if they are still soft and pliable. I think baking this dip is essential. 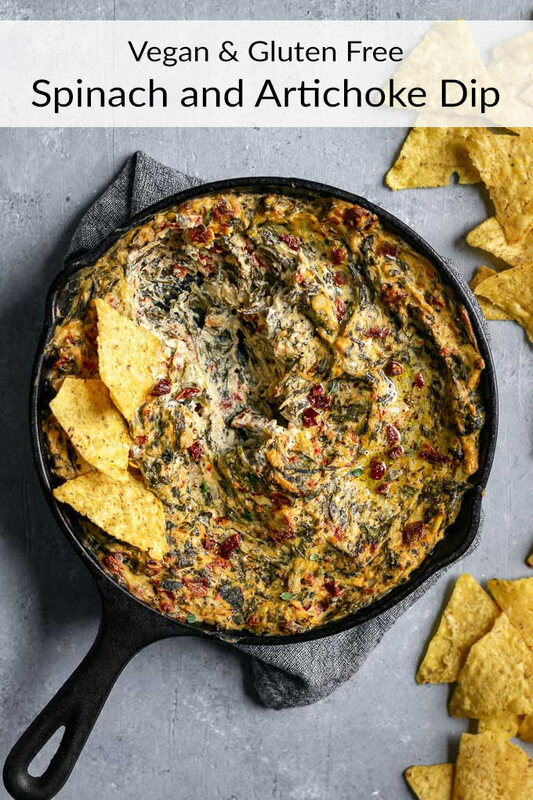 It allows all the flavors to meld and marry and there’s nothing like scooping up hot dip on a salty crisp [tortilla] chip. This dip is so good. Did I mention it was the best? 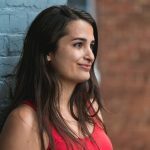 I’ve served this recipe to quite a few omnivores over the years and there are never any leftovers. It’s scrape the bowl clean delicious! It’s also cool to make it just for yourself, or mayyybe to share with your parter. I mean, it’s probably my favorite way to inhale my veggies. And inhale it you will! So I think where we’ve left it is: everyone loves spinach and artichoke dips, I make a great one, you should make it too. Cool? cool. And did I mention how easy it is to make?! Mix together the ingredients in just a few minutes, then stick in the oven to bake for a half hour. Dinner, *ahem* I mean dip, is served! 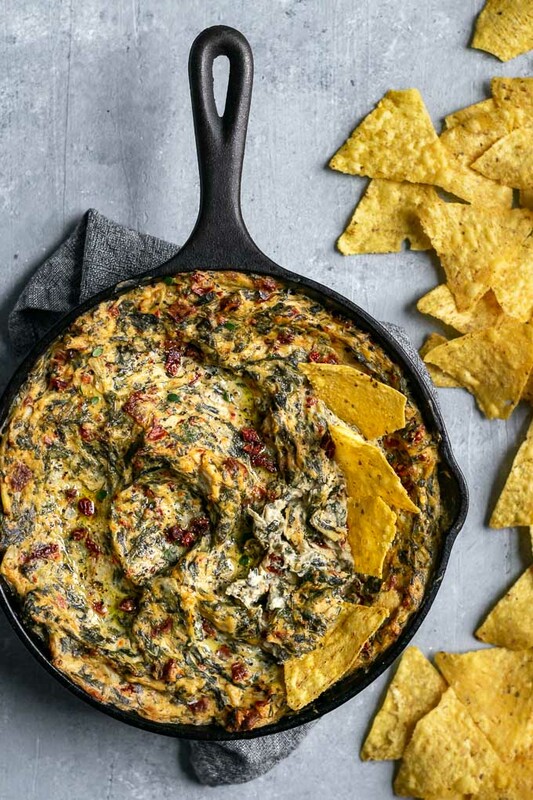 If you make this vegan artichoke spinach dip, leave a comment and rate the recipe below! And tag your recreations @thecuriouschickpea and #thecuriouschickpea on Instagram, I absolutely love seeing your photos! I used Tofutti Better Than Cream Cheese to keep this recipe inexpensive and nut-free. You can use any vegan cream cheese you’d like, even a homemade one! You can substitute the nutritional yeast for a vegan parmesan, or even a vegan mozzarella. If using a vegan cheese I’d add probably add a bit more, maybe 1/2 cup. You can prepare the dip in advance and leave in the fridge until ready to bake. 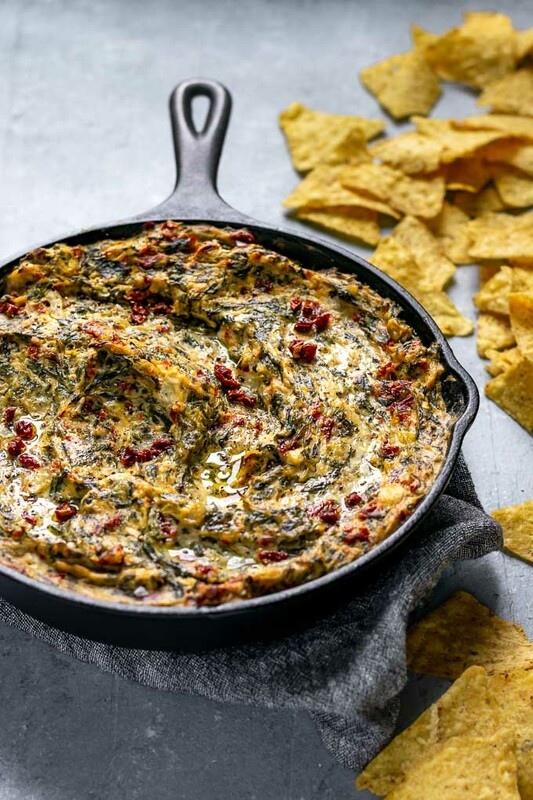 This delicious baked vegan artichoke and spinach dip comes together in no time! It's easy to make, super flavorful and indulgent tasting, and happens to be healthy-ish. It's the best! In a food processor, blender, or large mixing bowl using a stick blender combine the vegan cream cheese, silken tofu, nutritional yeast, canola oil, lemon juice, dijon mustard, and garlic. Process or blend until silky smooth. If using a food processor or blender transfer to a mixing bowl. Stir in the the herbs, crushed red pepper, 1/2 tsp salt and pepper. Taste and add salt if desired. I like about 3/4 tsp salt personally. Add the chopped artichokes, spinach, and sun dried tomatoes and stir to combine. Transfer to a small cast iron or baking dish and drizzle a little olive oil on top (optional). Bake for 30 minutes until hot and bubbly and browned on top. Sprinkle some extra minced sun dried tomatoes and fresh herbs on top to serve. Enjoy with tortilla chips, potato chips, or toasted baguette. Adapted from my original Artichoke and Spinach Dip recipe.